Eyewitness accounts - We have Matthew an original apostle of Jesus, Mark recorded Peters memoirs, John apostle of Jesus, Luke recorded eyewitness accounts of those who witnessed the teachings and actions of Jesus. Paul passed on teachings and experiences that he had with the apostles and revelation. James brother of Jesus, etc..etc..
1. Why do you think Mark, Peter's companion, wrote Mark? Then again, Mark wasn't an eyewitness, so it's not a first-hand eyewitness account. 2. Why do you think Matthew, the apostle, wrote the gospel of Matthew? 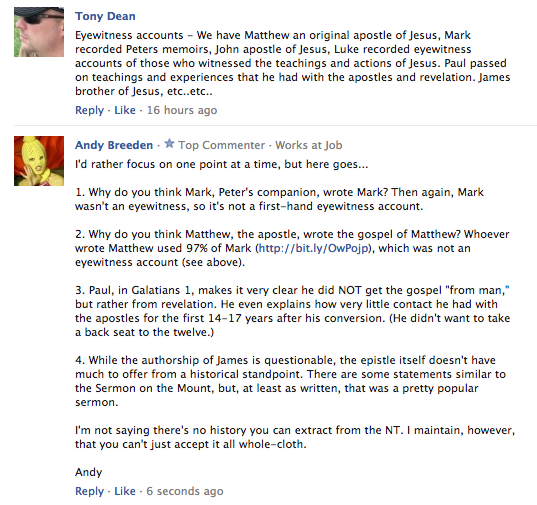 Whoever wrote Matthew used 97% of Mark (http://bit.ly/OwPojp), which was not an eyewitness account (see above). 4. While the authorship of James is questionable, the epistle itself doesn't have much to offer from a historical standpoint. There are some statements similar to the Sermon on the Mount, but, at least as written, that was a pretty popular sermon. I'm not saying there's no history you can extract from the NT. I maintain, however, that you can't just accept it all whole-cloth.